The Corvette L88 Scuderia Filipinetti Le Mans Racer holds a significant place in Corvette's racing history. With a coil spring front suspension and an L88 engine prepped by Zora Arkus-Duntov and smuggled out the back door to circumvent GM's ban on racing, the L88 was driven at the 1968 24 Hours of Le Mans by Henri Greder and Umberto Maglioli. The car dominated the Porsches and led the GT class until the 6th hour when a carburetion problem melted a piston. The Corvette returned to Le Mans in 1969 where it again dominated the competition and led the GT class for 16 hours before it retired due to another mechanical failure. Greder then drove the L88 Corvette that September in the Tour de France, a 5,000 km marathon over nine days including 11 events at 9 different tracks. Despite a constant engine misfire, Greder and co-driver Vigneron captured seven of the eleven events. The L88 Corvette was then sold to Jean-Claude Aubriet who campaigned it four more times at Le Mans from 1970-73, finishing as high as 18th overall and 2nd in class. The L88 Scuderia Filipinetti Le Mans Racer holds the record at Le Mans for single chassis starts (six). Today the Corvette has been restored and now sports a 70's vintage 454 made to look like the classic L88. It retains the coil spring front suspension developed by Zora as well as its M22 "Rock Crusher" close ratio gearbox and J56 heavy duty brakes. Documentation includes copies of the original A.C.O. entry forms from its six appearances at Le Mans. Le Mans is an invite only race and Goodyear wanted to run their new slicks on the Corvette, so they went to Ferrari and asked them to give up one of their entries so the Corvette could race, they agreed under 2 conditions; the car was painted "Ferrari" red , and the North American Racing Team logo with the Ferrari prancing horse was displayed on the side of the car. This 1968 Corvette took 7th in class and 15th overall at the 1972 24-Hours of Le Mans race. Although the Dave Heinz-Bob Johnson team was a private effort, Chevrolet unofficially supported them and provided the team with an L-88 427 ci engine and M-22 Rock Crusher transmission. During practice the day before the race, the car ran over a banner and hit a wall. Working overnight, the damage was repaired and the car raced at Le Mans with racers tape and rivets holding the front end on. The success at Le Mans wasn't a fluke. The car also finished 3rd overall at the 1973 24-hours of Daytona, 6th overall at both the 1972 and 1973 Daytona races, and started on the pole at the 1973 12-hours of Sebring. Today this car is located at the Mid America Motorworks MY Garage Collection. 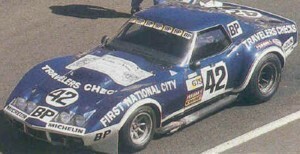 This L88 took 1st in class at the 12hrs of Sebring aswell as the 24hrs of Daytona. Sunary DX was a Southwest regional oil company based in Tulsa, OK. The company formed a motor sports division to promote its products. 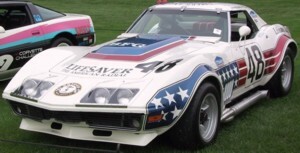 This Corvette was car number 3, and was a factory L-88 that was ordered through Yenko Chevrolet. Dan Yenko worked with Sunray DX and prepared the car for racing. The car was produced in February 1988, just a few weeks before the Sebring Grand Prix of Endurance. After preparation at Yenko's dealership in Cannonsburg, PA, the #3 Corvette headed for the race in Florida. The first time out, the #3 Sunray DX Corvette, driven by Dave Morgan and Hap Sharp, won the Grand Touring class and placed sixth overall. This Corvette traveled 1,081.6 miles and finished higher overall than any other Corvette in the history of the Sebring event. In 1972 John Greenwood raced the "Stars & Stripes" Corvettes at the 24hrs of Le Mans in Europe, setting a Mulsanne straight-away record of 211 mph. The #8 won an incredible 46 of 49 starts in its heyday! In 1969 it was a record setting car at Daytona clocking in at 200+mph, then went on to a Northern Pacific Division Champion SCCA A Production in 1969-1970 and in 1978 became an SCCA A Production National Champion. Today, the car is preserved as it last raced to victory at Road Atlanta in 1978. Today this car is located at the Mid America Motorworks MY Garage Collection. On December 4th, 1971, Garrett Waddell won the GTO (over 2 liter) Class at the Alamo 200 IMSA race at Texas International Speedway (now TWS), in College Station, Texas, becoming the first Camel GT series, GTO Class Winner. After testing big cube to the Mans 68 with the Corvette of the Scuderia Filipinetti, Henri Greder ends up to repurchase the car, running 69, and is founded the Greder Racing Team, a specialized structure in the preparation of the products GM and the conception of kits sport. The maintenance of the GT US of which it has just done the acquisition falls evidently in the giron of his young team. Between times, as promised, Zora Arkus Duntov prepares for him a new Corvette regarding the 24 hours of the Mans 1970. Painted in yellow and black, the Vette is a provided convertible of a hard top. His V8 7,0 liters of 550 horses induces without poorly the 1312 kg of the vehicle. Taken by Greder himself and John Rock Rouget, the Chevrolet is qualified, in 4'10"5, with the 35th time.